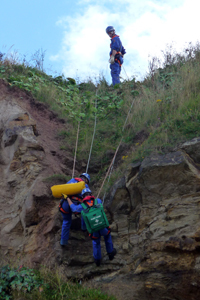 As promised I have been able to feature a second gallery page attributed to our local Mobile Coastguard Unit. It is only with Alan Wastell's help that I have been able to present this page, I found myself in a bit of a quandary when creating this page as Alan already features in my "Gallery" section, but in the end I felt that these two gallery pages are more at home within my lifeboat pages. 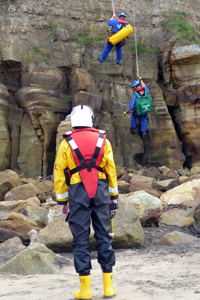 I will be adding greater information introducing our local coastguard unit as they play an important role working alongside all the emergency services. 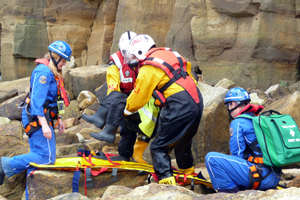 The photographs featured on this page and my second Coastguard gallery page were taken at the recent annual regatta during a very impressive rescue exercise by Alan Wastell and I present them here with his express permission. 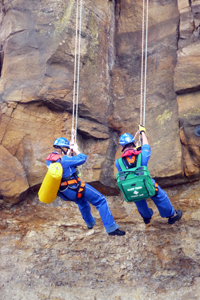 These photographs are ideal for presenting the type of work the Mobile Coastguard Unit often finds itself facing, however it is worth pointing out that this exercise was carried out on a sunny day but the team can often find itself out in completely different conditions. 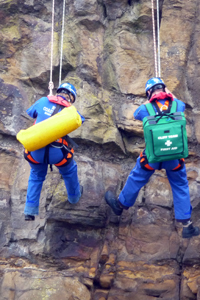 Like lifeboat crew members, the coastguard unit is also made up from volunteers, people who are willing to give up what they are doing day or night, in sunshine or gale force winds. 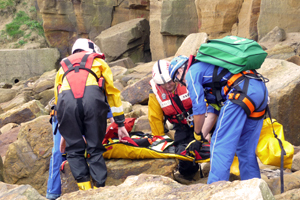 The following link leads to my final gallery page to see my last selection of Whitby Coastguard images.